High Roller Records have recently discovered their predilection for re-releasing later records by lesser known bands from the NWOBHM movement. After the really awful Chariot album, we get one by Gaskin which is only marginally better. The band formed by vocalist, guitarist and keyboarder Paul Gaskin was active between 1980 and 1982 but still managed two releases in that short time two longplayers and two singles. In 2000 they tried a comeback to little success. High Roller Records decided to give that album another chance, maybe to celebrate its tenth birthday. Things start out even quite ok, as the opener The Man Is Back actually catches the spirit of early Eighties metal, getting you to want more of this. Unfortunately the expectations are soon disappointed when the songs are drifting into toothless poser and hard rock territory. I can’t help making comparisons to Foreigner (Still Got The Hunger), ZZ Top (Stand Or Fall) and Y&T (England My England). The musicians have a few nice ideas that are never enough to catch the listener’s attention for the duration of this nearly one hour long album. This re-release can be shrugged off as a waste of material. 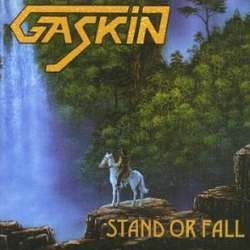 It would probably have made more sense to revive the old classics, because Stand Or Fall saw the light of day in an age where Gaskin had lost already most of their verve.